Ty Usey, a JA fifth grader, won the school level National Geographic Society Geography Bee on January 10 at the PAC. Runners up were sixth grader Reese Anderson, first runner up, and eighth grader James McLemore, second runner up. 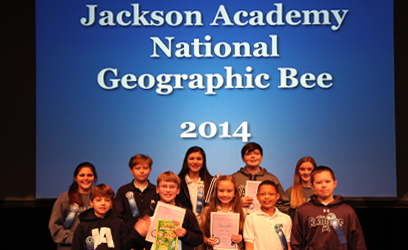 Jackson Academy students have participated in the National Geographic Society Geography Bee since 2005. The bee is designed to encourage the teaching and study of geography. This year, students in fourth through eighth grades participated. This is the first year for seventh and eighth graders. Fourth through sixth grade students participated in classroom competition first. Faculty members asked for volunteers from the seventh and eighth grades. The two students in each grade who scored the highest in the classroom, and from the seventh and eighth grade volunteers, moved on to the school level competition. There are three levels of competition: school, state, and national. The JA school level winner takes a written, multiple-choice test to quality for the state bee. Our winner must score in the top 100 students in the state to advance to the state bee, which is usually held in April. The state winner moves on to the national competition in May. The national competition is usually televised. Every year since JA began participating in the National Geography Bee, our winner has qualified for and participated in the state bee.